Concept: The concept of a weave-along is simple. Once a week on Sunday during the span of the weave-along participants receive an email from us going over (in detail and with pictures, descriptions and sometimes even video) the steps of how to make a particular project. The project is split into seperate parts, each part being a different email, allowing participants to work on the section detailed in the email sent on Sunday during the following week. Typically we archive weave-alongs, but this one will NOT BE ARCHIVED and will only be available “live”. This doesn’t mean you can’t save your emails and work at your own pace, but it should encourage you to work at the pace of the weave-along. A very important aspect of the weave-along is the social aspect. Each week we encourage you to ask questions, to share pictures of your progress, to answer questions and to interact with other participants on Facebook, Ravelry, Twitter (hashtag #weavealong10) and via email (if you aren’t a social media user we’d be happy to post your pictures and progress for you!). A weave-along is meant to be an online re-creation of a class with friends. Learn, share and be inspired! When you sign up, we ask you to click “YES” and agree to “Participate, ask questions, etc.”. Please do, and help make this weave-along a more social experience for everyone involved! 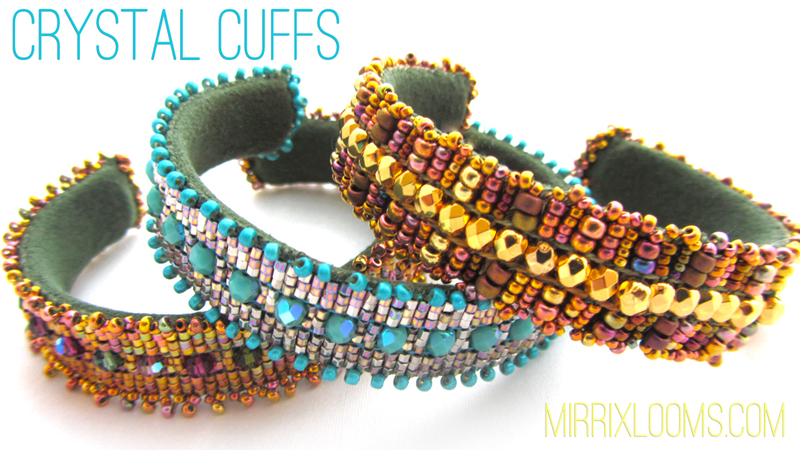 Project: The Crystal Cuff is a gorgeous bead and crystal bracelet on a resizable brass cuff.